If you encounter problems, make sure the ASPNET system process has "write" privileges for the directory. How? The Telerik Editor control for ASP.NET AJAX puts an end to the “functionality vs speed” trade-off. The unique “load as needed” processes will only load the code on client browsers for the features that are being used. This minimalist script size results in tremendously swifter page loading. In addition, the editor’s CSS Sprites-based semantic rendering leads to even more optimized loading speed and customization through simple CSS. RadEditor for ASP.NET AJAX comes with a full-featured multilingual spell-checker (technically, a separate component called RadSpell). You can choose between a dialog-mode and an inline AJAX spell-checker. You can check your spelling asynchronously and all your mistaken words will be highlighted inline. Tag Inspector - displays the tag hierarchy of the current selection and allows you to add/remove/modify a tag. Properties Inspector - gives you quick access to most of the properties of the current tag, eliminating the need to open dialogs. Real-time HTML View - similar to the Split mode of Microsoft Office FrontPage - if you make a change in either the WYSIWYG or the HTML window, the other one will be automatically updated. Great fine-tuning tool for advanced users. Statistics module - provides word/character count or other content analysis. The main way to save the RadEditor's content in a database is to add your own asp button with database-saving code attached in the button click event handler.The above example does this using an asp datagrid to view the updated content of the database as well as Edit and Delete the content. 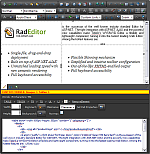 The Content property is used to get and set the editor content. Please, note that the page is not XHTML compliant due to that the <a> tags loaded in RadEditor contain target="_blank" attributes. There isn't a target attribute in XHTML specification. Right-click on the web application folder, and select Properties. Click "Add..." to add a user. On the new dialog click "Advanced...". On the new dialog click "Find now...". Select ASP.NET user from the list of available users. When you go back to the "Security" tab select the ASPNET user and give it full permissions. Please, fill in text to submit! <telerik:RadGrid RenderMode="Lightweight" CssClass="borderedGrid" ID="NewsGrid" Width="1000px" runat="server" ShowHeader="True"
<HeaderStyle CssClass="newsTextCentered gridHeader" Font-Names="Verdana" ForeColor="Black"
DeleteCommand="DELETE FROM [News] WHERE [NewsID] = @NewsID" InsertCommand="INSERT INTO [News] ([NewsText], [NewsDate]) VALUES (@NewsText, GETDATE())"